Amazon flash sale of Nokia 6 will start at 12 PM today(23 August 2017). The registration was ended yesterday for the sale. So if you have registered for the sale, login to amazon atleast 5 minutes before the sale starts and try your luck as Amazon says there are a limited pieces available for this sale. You will be getting Rs. 1000 cash back to your Amazon Pay balance (So the effective price will be 13,999). This is for the Prime members only. You can get INR 1800 off on Hotels and INR 700 off on flights when you use MakeMyTrip. remember this sale is for the users who registered before 21 August 2017, if you missed that you can register for the Next Nokia 6 Sale on August 30, 2017. 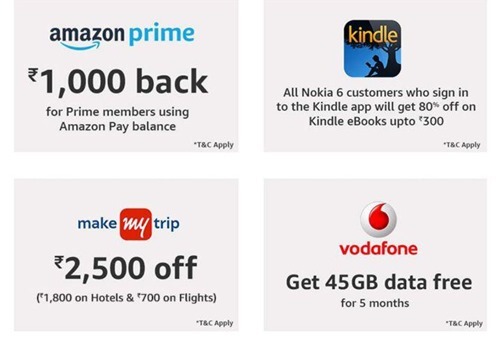 Nokia 6 Flash sale today, Offers including INR 1000 Off. Rs. 1 Flash sale, Bid to win and other discount offers for this Diwali.